I bought this record recently, after reading an excitable and positive review in The Wire magazine. I thought I’d go direct to the source, and so ordered it through Finnish record label Fonal’s website – I do so enjoy receiving parcels from far-flung lands in the mail. There’s no indication of who produced the artwork for the record, or indeed what exactly is going on in the photograph on the front cover. 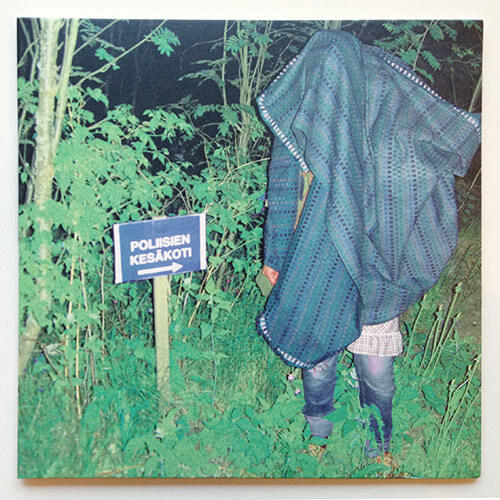 “Let’s use that photograph of somebody with a blanket over them standing in undergrowth next to a sign that says Poliisien Kesäkoti” – did that conversation actually take place? Thanks to Google Translate, I now know that Poliisien Kesäkoti is Finnish for “The Summer Home Of Police Officers”. That doesn’t really help to decode the photograph or its message. “Nuttu Nurin” means “Jacket Inside Out”. Hmm. Olimpia Splendid – Jukka-Pekka from Hevosburger on Vimeo. 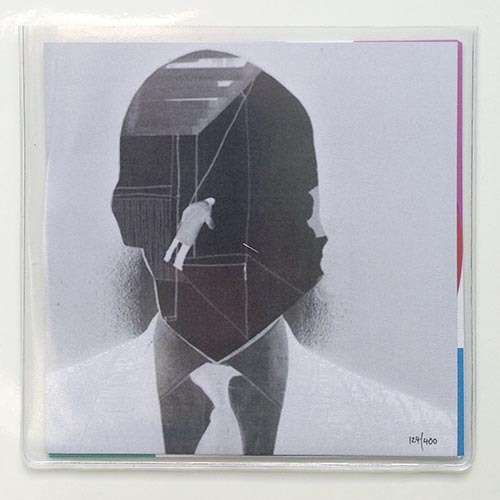 There’s rather an air of mystery surrounding many aspects of this split 7″ single, pressed on white vinyl. Karen Novotny X is not an individual but a band; they take the A side and spin at 33 rpm. According to the notes on this record’s insert, their track was recorded in East London between winter 1979 and spring 1980 – whether this is actually true is another matter. This and their other releases are all quite recent, and the internet yields nothing that helps to position Karen Novotny X as anything other than a recent band. Unless a couple of different record labels have conspired to release archive recordings at around the same time; and unless nobody had heard of and written about this band before very recently; and unless somebody has taken it upon themselves to run a Facebook page for them which to all intents and purposes looks to be full of the things a currently-active band might share to promote themselves, well, I posit that they’re a band of The Now. Regardless, ‘Join Hands’ is nice, a kind of John-Carpenter-at-a-slow-disco tune that suggests a love of analogue synthesisers and spooky minimal electronica of the late 1970s. Such aural pleasures are somewhat shared with ‘Near 86th’ by Samantha Glass, which occupies the 45 rpm B side of this record. Now, Samantha Glass isn’t exactly a person as such; it’s a pseudonym, alter ego or alternative name of somebody named Beau Deveraux, who has released cassettes and things through Deep Distance as well as other labels like Not Not Fun. The preferred jam of Glass/Deveraux is a smooth kind of hypnagogic-pop-it’s-okay-to-like – 1980s-tinged but more in terms of world-of-wonder electronic repetition than bombastic, hyper-compressed vocal tunes. Deep Distance releases tend to come in stock label sleeves*, and this one is no different, although this is augmented by a hand-numbered insert, one side of which makes for a very mysterious mono cover image. As with many of the label’s releases, the artwork was put together by Dom Martin who runs both Deep Distance and sister label The Great Pop Supplement. The collage art used on the insert is by Ingrid Christie – this one, I think – a fine art graduate from the University of Central Lancashire who also completed two years of a science degree, including a 100% grade in mathematics. Apparently. 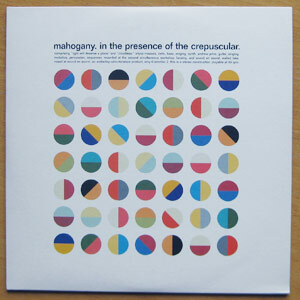 Science + Art = Spooky Record Sleeves, it would seem. Launching the magazines Careless Talk Costs Lives and Plan B in the 2000s; both excellent magazines, both missed. Six – six – ‘players’ are credited on the rear sleeve, which is a surprising number if you’ve ever heard the songs. They’re certainly of their time, very sparse, worthy, student-politics-y and, well, pretty poor. Not really a repeat-player, this record, unless I’m feeling like punishing myself. It comes with a free flexi! 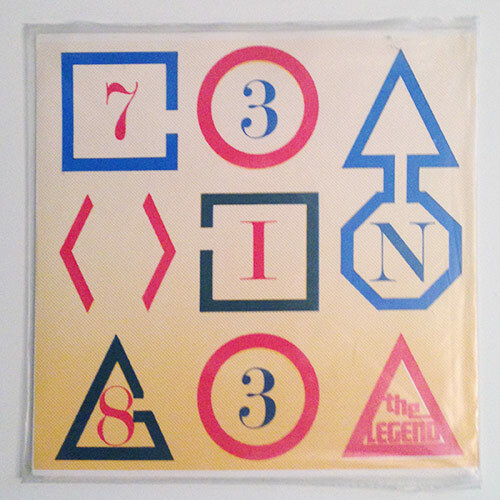 This is the good stuff, really – a two-song 33 rpm flexi featuring charmingly naive and poppy songs by Laughing Apple (featuring Alan McGee, who of course ran Creation Records and Andrew Innes, who went on to feature in Revolving Paint Dream and Primal Scream) and The Pastels. The design of the sleeve – a vaguely agitprop-looking and not altogether unpleasant layout – is credited to Communication Blur which was also the name of a fanzine run by Alan McGee in the early 1980s and, presumably, an alter ego for McGee as graphic designer. He’s also credited as one of the ‘players’ as well as getting a production credit here. Busy fellow. Starting as he means to go on, really, as throughout the lifespan of Creation Records he was pretty heavily involved with most aspects of everything. Update 07/01/14: Thanks to Jerry/Everett for filling me in on a bit of extra detail to do with this record! Apparently the drums and guitar on the record were both played by McGee – the songs came out of a band that Thackray/True and McGee had together for a short time – and the sleeve design was in fact by Ken Popple, the drummer on early Biff Bang Pow! releases. There are lots more True-isms to be had at his excellent blog, The Electrical Storm. It’s been a while since I posted here – I’ve been sans turntable for a few months now (I know, it was cruel and inhuman) but I’m celebrating seeing in 2014 with a new one, which arrived today. So let’s get back to business! As I’m sure I’ve mentioned here before, The Great Pop Supplement is one of a few labels whose releases I’m pretty likely to pick up as soon as they come out. Because of this I’ve got quite a few records by London’s The See See, who I imagine are one of the artists released by GPS with the highest count of ‘product’. It’s lucky that they’re good, otherwise I’d have a pile of The See See records getting in my way. This 7″ comes packaged in a sleeve with a spine, which is always a pleasing thing – nothing wrong with giving such records a bit of bulk and presence; they deserve it. 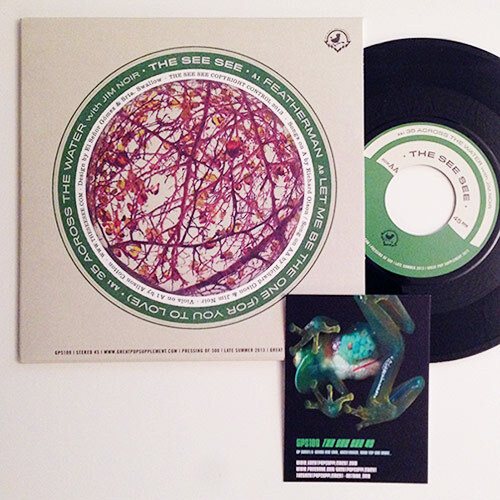 The artwork here – a fish-eye pastoral photograph thang encircled by liner notes – is repeated on both sides, meaning that the sleeve can be held and flipped around with nothing changing. It’s the text on the spine that dictates which is the front and which is the back, unless we decide to use the ‘other way round’ way of reading text on a spine, like they do (for example) in Germany. The sleeve design is by El Señor Gómez & Srta. Swallow, which I was convinced was some kind of in-joke name until a quick Google search turned up their (rather fine) websites here and here. Musically these are three good songs for a grim, chilly winter day, like it is today. ‘Featherman’ is a slice of sun-kissed melodic guitar pop with at least one foot in late 1960s California; ‘Let Me Be The One (For You To Love)’ is a slightly more psych-tinged romp of a song with a wicked descending-note chorus; ’35 Across The Water’ is halfway between the two – eyes-of-wonderment vocals leading the lyrics around a richly tuneful slice of pop-psych with an oh-heck-now-we’re-heading-into-space outro. The cover artwork is superb – a bit of pseudo-Bridget Riley op art that hints at pixellated imagery, semaphore and all kinds of ‘hidden codes’. It’s the sort of cover one could obsess over for hours. The label, Amberley, was a one-man outfit that had a lot of time and energy put into it (I used to correspond with the guy behind the label, and can vouch for his total belief in what he was doing) – by the time of this Mahogany record’s release Amberley had also put out singles by several other great bands of the time, including A.M.P Studio, Gnac, Navigator and Lazarus Clamp. The record itself is pressed on super-heavy vinyl – and that’s quite a bit more expensive to do than the ‘normal’ weight of seven inch vinyl. Why bother, one might ask? Well, it does make the record sound better. It also makes the record feel better, like a item of intrinsic value that will sit confidently and comfortably on your turntable. Included within is a properly-printed, folded insert with details of Amberley’s releases – something more than a simple cut-up photocopy insert. Hell, maybe every single released independently is by definition a ‘prepared with love’ artefact. It’s just that not all of them show it so obviously, I guess. To me, I don’t understand why somebody who’s putting in the extraordinary time and effort required to simply get a record made and out there in the world wouldn’t extend that time and effort into all of its aspects – design, presentation, quality and style. Ticking all of those boxes is, for me, as DIY/punk as it gets: so much more so than intentionally presenting things in a scrappy or rough way to create some kind of (perhaps false) idea of ‘real’-ness… Maybe it depends on the kind of music, though. For this kind of music (refined, subtle and stylish post-rock), this presentation works for me. Australian band Even As We Speak were an ambitious lot, in the context of the often-lazy, often-detail-rather-than-big-picture world of indie-pop. This EP, for example, plays at 33 1/3 rpm rather than the usual (for Sarah Records, at least) 45 rpm – yet it still only contains one song per side. What does that mean? 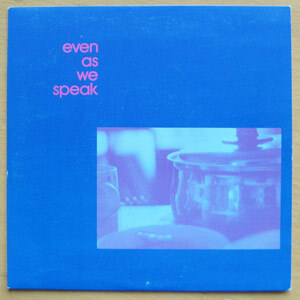 Why, that Even As We Speak were a veritable prog-rock behemoth of a band – comparatively speaking. These two songs are pretty long, pretty inventive, and include forays off in various directions (including pseudo-New Order style electronic tinges), turning them into tiny epics rather than mere simple tunes. It was all leading up to their later Sarah album, Feral Pop Frenzy, which was – at the time, and possibly even now – outstandingly ambitious. It had seventeen songs, ran (I think) for over an hour, and was a proper ‘journey’ of an album, and one that even hinted at Concept Album status, with melodic references popping up from song to song. At their heart, and in their overall sound, Even As We Speak were proud indie-pop badgewearers. I do remember thinking around the time of their releases, though, that they were somehow different – one of several bands at the time that hinted that whilst indie-pop, as we all know, don’t stop, there’s no reason why it can’t be experimented with and pulled in different directions. How grown up! The photograph of saucepans on the Factory Records-design-style cover is credited as ‘Yukino’s Saucepans, by Akiko’. I wonder if that was Akiko who ran Sugarfrost Records at around the same time…? I did a quick search on eBay for ‘feral pop frenzy’ and there’s a vinyl copy for sale at £29.99. I won’t link to it, in case the auction has ended by now, but I will link to the seller – Oscar The Cat’s Records – who is worth mentioning as they include within their product photographs a cat, presumably Oscar. This is a great album and one that I listened to very regularly soon after its release. I was a big fan of Boyracer in the 1990s, as they bridged a gap between the indie-pop and the noisy weirdo music that I was simultaneously listening to a lot of at the time. They were more on the indie-pop side of things, but not afraid to veer into odd feedback or song structures on a whim, and this resulted in no end of catchy-yet-strange songs. This record is vibrant clear red vinyl, and the sleeve also contains an A4 photocopied insert that includes, as so many records did at the time, the actual postal address of one of the band – no PO Box number or faceless URL here. That postal address was a house on Spofforth Hill in Wetherby, West Yorkshire, which was also the street you’ll see in contact addresses on early Hood records. Hood, who towards the late 1990s got signed to Domino and for a brief period were ‘almost a big thing’, were very closely allied to Boyracer – as well as members living opposite eachother on Spofforth Hill, for a time they shared and swapped band members and appeared jointly on no end of compilation records and tapes (including several that I released myself). For a time I wished I lived on Spofforth Hill, to be part of what seemed like a very vibrant mini-scene centred around a single street: I was in touch by letter with members of both Hood and Boyracer for some years, and between them they furnished me with a lot of musical knowledge in the form of mixtapes, recommendations and through their own music. 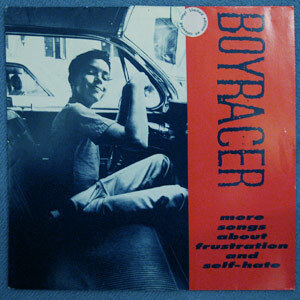 A Turntable Friend was an indie-pop record label based in Germany, who were a bit of a ‘German Sarah records’ – indeed, Boyracer released records on Sarah as well as A Turntable Friend. There’s a good discography of everything released by the label on the TweeNet website, which also includes a not-comprehensive-but-not-bad list of Boyracer releases. The inner sleeve of my copy of More Songs About Frustration And Self-Hate is signed by Stewart and Nicola of the band. This makes me happy today, as it did on the day the record arrived after my purchasing it directly from that house on Spofforth Hill. 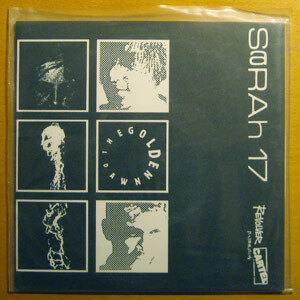 Another seven inch single on Sarah Records. I guess there’s a stronger chance of such releases being the ones that pop up as a randomly-selected choice, because there are a lot of them in my collection! This The Golden Dawn isn’t the 1960s The Golden Dawn, of course, who released the outstanding psychedelic LP Power Plant. Perhaps I’ll talk about them on here at some point in the future – it’s all in the hands of the random number generator, as you know… This The Golden Dawn do have a bit of a psychedelic edge, I have to admit, although it’s shot through with a healthy dose of indie-pop simplicity and lightness. The Golden Dawn and 14 Iced Bears were two of the Sarah bands that I liked the most – they seemed to have a slight edge that took them beyond the most straightforward indie-pop, and in their case it took them into a somewhat 60s-tinged edge that pressed my buttons during the early ’90s. (Of course, the entire C86, indie-pop and fanzine scene had a rather healthy obsession with the 1960s – but generally it seemed to take the form of the imagery or personalities of the time, rather than directly influencing the music). As with most of the Sarah releases before roughly SARAH 40 or so, this record included a poster insert. It shows The Golden Dawn with a selection of high-contrast monochrome photographs, which reflect the style (and, more specifically, haircuts), that were so popular around the time because of bands like Jesus And Mary Chain and Primal Scream. At this time, all that a good band photograph needed was a couple of bowl haircuts, a paisley shirt or two, a slightly otherworldly look around the eyes and a lot of contrast. The other insert included in the record is one of Sarah’s ‘also for sale’ lists, in the form of a long, thin, folded piece of paper. Even at the time of this record coming out, SARAHs 1 through 10, 13 and 14 had all sold out. The rest were still available, though, for the fantastic price (including postage) of just £1.70 apiece. The insert also reports that Heavenly’s ‘I Fell In Love Last Night’ was just about to be released – a record that would nicely bridge the gap between the ‘old days’ of Talulah Gosh and the new sound of Heavenly, who would become intertwined with Riot Grrrl and quite heavily influence a lot of bands and musicians. I think this is the first Shellac record that I’ve mentioned on here. I’m calling them Shellac Of North America for this post because that’s how they specifically seem to refer to themselves on this record: on previous albums the ‘Of North America’ part has seemed more of a strapline, but on this one, it forms part of the band name as it’s presented on the sleeve. It seems important to get this correct because the band – or rather Steve Albini, the driving force behind Shellac and a notoriously exacting individual – would no doubt think it a vital detail. 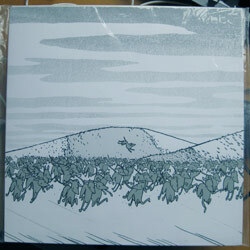 As with all Shellac releases, the packaging for Excellent Italian Greyhound is exquisite. Inside the polythene outer bag (sealed shut with a printed sticker that I carefully cut through with a scalpel), the gatefold sleeve is wrapped within an outer dust jacket that shows illustrations by Jay Ryan (a member of the excellent band Dianogah). The gatefold sleeve itself shows photographs of, indeed, the Excellent Italian Greyhound of the album’s title, sat atop a pile of brightly-coloured fruit, and this sleeve contains a printed inner sleeve that finally reveals the record itself, pressed on super-thick vinyl. The only part of the package that seems an afterthought, or an element to not have been given ultimate care and attention, is a CD copy of the album, thrown into the gatefold as a blank, unprinted disc. That seems to suggest the weight that Shellac/Albini place on vinyl’s precedence over CD. The album’s opening song, ‘The End Of Radio’, builds slowly as simple bass chords underpin Albini’s flat-yet-powerful words. I first heard this song when I saw Shellac playing live at, I think, Koko in London. What was already a very exciting gig to attend (as, based on previous Shellac gigs, I knew I was not only in for some perfectly-presented music but also a super-entertaining performance) was made more special by the support band being Lords, whose guitarist Chris I am a friend of. ‘The End Of Radio’ seemed like a soundcheck at first – if you know the song, you’ll understand why – before exploding into life after several quiet, building minutes. I met Steve Albini once at All Tomorrow’s Parties in Camber Sands, when Shellac were curating the event. After an alcohol-heavy day a friend and I were in the bar and she spotted Albini at a nearby table. It was often remarked in the past that I look somewhat like Albini, so my friend took it upon herself to pick me up, drag me to his table and introduce me with a “Hi Steve! This is Simon. He looks like you!” before retreating and leaving me to fend for myself. I handled the awkward occasion as elegantly as I could muster – slurring something like “Thissh is a really excshellent weekend, thanksshh so much…”. To his credit, Albini didn’t deliver a cutting putdown as he so often does with hecklers at gigs; he shook my hand, said thank you and left me to wobble off to continue my festival experience. This is one of a little batch of records that my Dad once bought for me. He was away on a trip in America – I forget where, New York perhaps? – and decided that I might like some records as a holiday gift. This was a most wise decision! Enterprisingly, he made his way to a record shop and asked the owner to recommend a few records based on some facts about what I was into at the time: I liked indie-pop, I liked seven inch singles, and I seemed to like those records with wraparound sleeves that came in plastic bags. The shop owner picked out around five new releases that fitted the bill and, well, it was a great gift to receive! 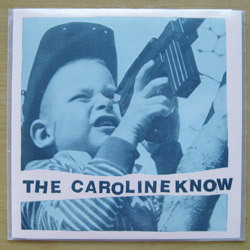 The band is called The Caroline Know: Seems that they were based in Northampton, Massachusetts, although the contact addresses on the record suggest otherwise. They did live in New York; after that, Northampton. They have a MySpace page. The band includes people called Stephen Rand, Les Labarge and J Loenstein: Very sadly, Stephen Rand passed away earlier this year. My condolences to his friends and family. The J stands for Jim: Jim Loenstein. Google tries to alter this name to Lowenstein. According to the sleeve, the band could once be contacted by writing to 226 East 2nd Street, 4B, New York: Look, that’s here. According to the insert, the band could also be contacted by writing to 102 Bedford Avenue, 2R, Brooklyn, New York: That’s here. Looks nice! I like Brooklyn. There’s a place called Turkey’s Nest Tavern on this street as well; I wonder what it’s like? According to Yelp, they do alcoholic drinks in a jumbo size, and offer an absinthe margarita! I’ve quite a few records on the Bus Stop label, and they’re one of the labels that I’d like to gradually collect everything from. There’s a partial discography, and brief introduction to the history of the label, here.